This week Sunday Supper is showing you how you can make the holidays extra special by creating some wonderful gifts from your kitchen. One of the things I love to do at the holidays is make homemade gifts for my friends and family. I have gotten my kids involved in it with me going back to when they were little bitty. I always had them make homemade cards and gifts because I just felt they were more personal and helped them to realize that you don't have to spend money to make someone happy. To this day I treasure each and every little treasure they made me, and many of the ornaments they made still decorate my Christmas tree every year. What they really enjoyed helping me with was the baking. Not just because they got to lick the spoons, bowls, and beaters (although I do think that was a big part of it), but because I would let them pick some of the treats we would be making for everyone. Oh there were years that we ended up with a mish mash of candies sprinkled into the cookies or fudge, but then there were the ideas that ended up becoming a yearly tradition. Like chocolate dipped fortune cookies, and dark chocolate fudge with maraschino cherries. Last year we went the adult route and made Christmas Fire Balls, a spin on the classic rum ball made with cinnamon whiskey, oohhhhh they are good! But seriously, it is amazing. My daughter, who was a huge Nutella fan, flipped for it, and my son tried to steal the entire jar!! When I have it in my cupboard I have to fight the urge to just grab a big ol' spoon and eat it straight from the jar. I guess I feel that slathering it on graham crackers is more civilized for some reason. So my little brain has been busy coming up with as many things as possible to use cookie butter in. One of the new family favorites is my Chocolate and Cookie Butter Marble Brownies. Then I, of course, had to combine two of my loves in one great dessert by making Browned Butter Pumpkin Brownies with Biscoff (which is a fancy name for cookie butter) Buttercream Frosting. My son actually dropped everything he was doing when he found out I was making them, and drove straight to my house so he could have some. I thought about making some cookie butter rice crispy treats (which will still probably happen), but I decided to go with a puppy chow AKA muddy buddies first. Kind of a Chex mix for the sweet lover, this stuff is like crack seriously addictive. We all love it. I was going to give this batch to the kids, but Kevin put a stop to that real fast! It is so good that I have to limit myself to one handful and walk away. Do NOT take the container with you to the sofa....I can not be held to blame if you eat the whole thing!! The next batch will be for gifts and you can best believe that it will be put into tins and wrapped ASAP so nobody can be tempted to eat it all! In a large saucepan over medium heat, combine cookie butter, butter, and chocolate chips until fully melted, stirring constantly. Slowly stir in cereal, mixing gently until cereal is completely coated (this will take a bit of time and patience). Transfer to a 2 gallon zip top bag bag, and pour in powdered sugar and shake shake shake until all of the pieces are coated with powdered sugar. Lay out to cool on a parchment paper lined baking sheet, then store in an airtight container. What a tasty snack and an perfect excuse for me to buy cookie butter. Oh yes Renee!! You need to by some soon!! YUMMY!!! I love this, I can see myself making it and putting into treat bags for people!! I have never made puppy chow before. When we go to San Diego over the holidays I am going to try to locate some of that cookie butter to try too. I think Trader Joe's has some. Great looking recipe! Yes, Trader Joes would have it but I got mine at Albertson's so you might want to check there (it would probably be cheaper), and I am soooo jealous that you are going to San Diego!!! Oh man! I couldn't have this around me! I would eat the whole batch! Great idea! I have made puppy chow with Biscoff before so I totally know about the addictive nature of this treat. It is so good and perfect to give people! I am a cookie butter fanatic, too! And your puppy chow sounds incredible!!! So fun reading about the antics of your kids, Bobbi...And so tempted now to go out a grab a jar of cookie butter! Oh yes yes yes you MUST!! I'm so glad you shared this recipe! I've had a few people ask me if I knew of a good cookie butter recipe so I'll be sure to send them your way! Yum! I love cookie butter and these look delish! I absolutely love puppy chow on a normal basis. But then you went and put cookie butter in it and I died of happiness. This sounds like the most amazing snack, one I'd definitely not be able to keep my hands off! 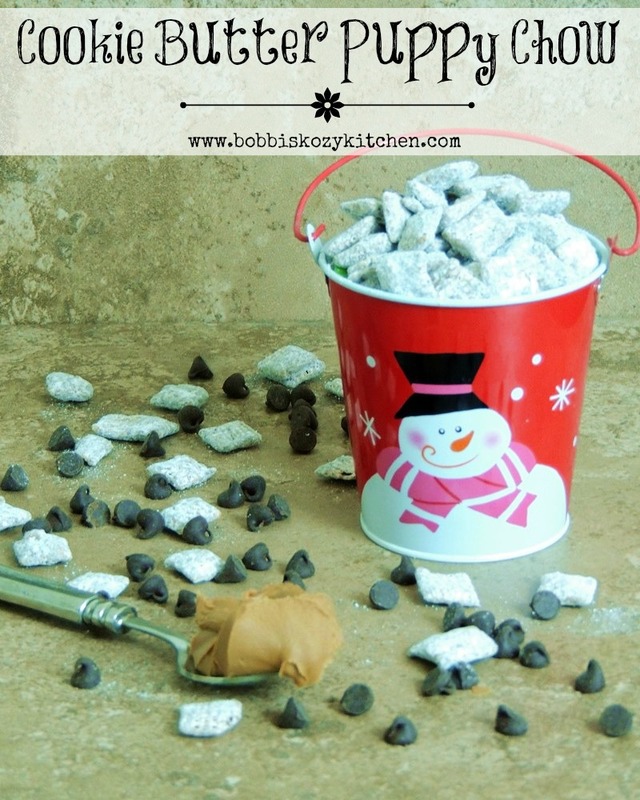 Cookie butter puppy chow? so I really need to try this! It sounds like a perfect snack while watching a holiday movie. Oh my! This looks like the perfect treat. I will weigh 1000 lbs by January. Just one more reason I need to go down and visit the states - buy cookie butter AND rice chex! Cookie butter needs to be in here! Great treat! Yeah, I would eat the entire box. That looks and sounds so amazing! !